Rene Martinez has been Wholesaling since January 2015, and he became a member of the tribe in October 2015. 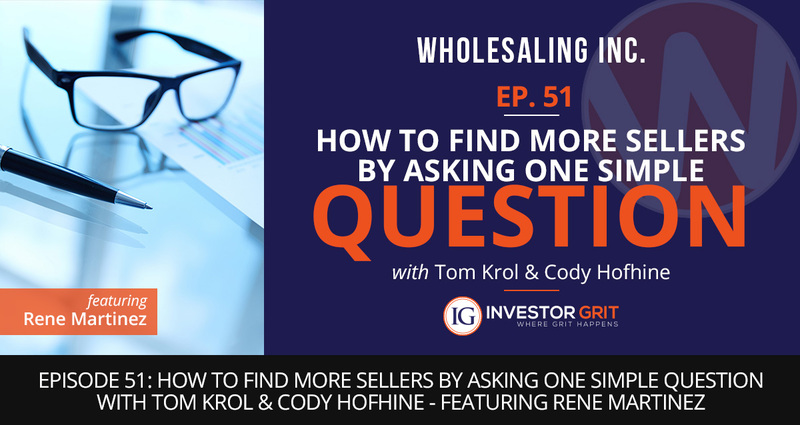 He has a full-time job at Corporate America, but he still finds time to run a successful Wholesaling business. Since joining the tribe, he’s made over 15 sales, and today he shares the deceptively simple strategy that helped him close a sale with $26,000 in net profit. Rene started Wholesaling alone. In the first nine months, he wasted money and blew through leads because his processes weren’t refined. He ended up losing $3,000… but things have changed since then. Rene joined the tribe and hired a mentor. He’s closed more than 15 deals in a little over a year, and that’s with a full-time job! Rene sent the Tribe’s postcard (our secret sauce!) in a mailer to the high equity list. A woman replied, originally asking to be removed from the mailing list. Before giving up on the call, Rene said he knew she wasn’t interested in selling any property and asked if she knew anyone else who was interested in selling property… as it turns out, her boyfriend was selling a house. This house was a golden opportunity. It was recently hit hard by a storm and needed significant repairs, the owner didn’t even live there actively, and he had recently taken a title loan out on the house. He was a very motivated seller! Rene purchased the house for $50,000 – the after-repair value of the house was $170,000. He moved the property to a cash buyer for $76,000. That’s a net profit of $26,000 from one Wholesale deal! And the deal never would have happened if Rene hadn’t asked a simple question. Get a lead on the phone. You can acquire new leads any way that works for you, but we do like postcards. If that lead isn’t interested, it’s okay! Take 10 more seconds to ask if they know anyone else who is looking to sell. Do this on every call. We said it up top, but it’s so important that we’re going to say it again: hire a mentor. They will hold you accountable and push you to do things that you may feel uncomfortable doing. Without fail, success is always on the other side of comfort. If you are Ready to Explode Your Wholesaling Business, Click here to Book a Free Strategy Session with me right now! Are you committed to failing? Copyright © 2019 Wholesaling Inc. - All rights reserved.